A tropical island paradise with unrivaled stunning and pristine natural beauty, a St. John honeymoon is a true escape from reality. It's clear why St. John honeymoons are so memorable and beloved. 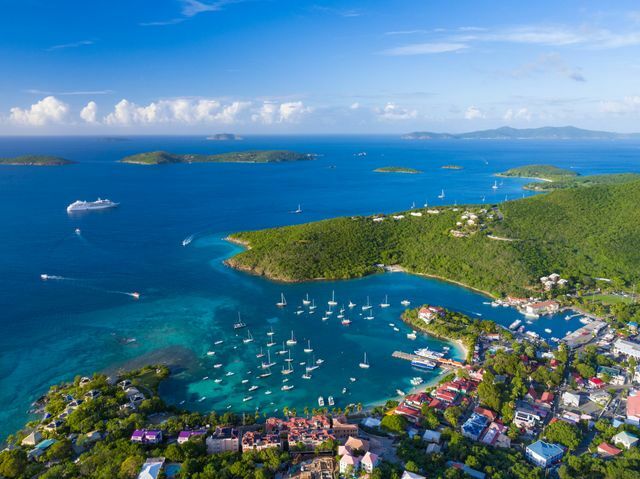 The Virgin Islands National Park comprises 60 percent of St. John, with its forested trails and rich exotic wildlife an absolute haven for the active couple and nature lovers. Teeming with stingrays, sea turtles, and starfish just to name a few, the island’s vibrant coral reefs are begged to be explored by scuba divers and snorkelers. For beach goers, St. John’s picturesque beaches hold the record as some of the world’s finest. A St. John honeymoon is ideal for the couple who loves adventure. Here's how to start planning your vacation of a lifetime. Though warm and balmy all year round, the high season for travel and St. John honeymoons generally occurs from mid December through to mid April, when prices are at their peak. Stay up to date on weather conditions when traveling to St. John between June and November, which marks their hurricane season. Cinnamon Bay: St. John’s longest stretch of beach is a playground for water sports enthusiasts and also boasts an onsite campground for the outdoorsy. Fly Fishing: Navigate the waters with an accomplished captain and learn the skills of fly fishing. Salt Pond Bay: The short hike to this relatively secluded beach is well worth it as the crystalline waters and sea turtles amongst the flowering sea grass emerge before your eyes. Daydreamer and Coconut Cruise: Embark on the Daydreamer or Coconut sailboat led by knowledgeable captains and spend your day exploring and snorkeling in three dreamy locations. Reef Bay Trail: Trace the footsteps of the nation’s native Arawak population on a guided hike through this trail with a park ranger and decipher its petroglyphs, uncovering the history of St. John. Annaberg Sugar Plantation: Established for the primary purpose of distilling rum, these well preserved remains of a sugar plantation from Danish colonial days reveal the history behind St. John’s slavery in the 1700s. Trunk Bay: St. John’s most celebrated beach flaunts impossibly clear waters and glittering white sand, inviting its visitors to laze under the warm Caribbean sun. Carolina Corral: Create special memories on your St. John honeymoon by riding through trails on rescue horses at Carolina Corral. Woody’s Seafood Saloon: This cozy bar is host to the island’s most popular Happy Hour, offering domestic beer for $1 and sides of tasty pub grub. Outdoor Beach Massage: Pamper yourselves during your st. John honeymoon with a therapeutic couples massage at the swanky Ritz-Carlton while tantalizing views of the picture perfect beach rests before your eyes. Paragliding: Soar above the placid Caribbean Sea and witness at great heights the island’s raw scenic beauty. Hassel Island: Embark on a daytrip to Hassel Island on neighbouring St. Thomas and ascend the old British forts of Shipley and Willoughby for stunning views of the island’s capital, Charlotte Amalie.